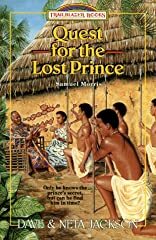 When the dying Kru king offers a ransom for his missing son, fourteen-year-old Jova determines to find Prince Kaboo, no matter what the danger. Without a prince to take the old king's place, his people will almost surely be defeated by their long-time enemies, the Grebos! And as a former captive of the cruel Grebos, there is nothing Jova fears more. But Jova has a secret advantage over the other young warriors who set out on the dangerous quest he knows where to look for the missing prince! Only Jova followed Prince Kaboo when he miraculously escaped the Grebo village where they both were held. And only Jova knows the prince traveled to the dreaded "white man's city" a place filled with people so strange-looking Jova was too fearful to enter. Now his search must take him right to that terrible place. What will he find when he arrives? For six long years, Jova has kept the secret -.